Advertisement for the 1928 opening gala at Yeshiva College. Given that the 1920s marked the height of Jewish exclusion from university life, it is perhaps not coincidental that the 1920s witnessed both a major attempt to found a national Jewish university (a forerunner to Brandeis University, which would only be created in 1948) and the opening of Yeshiva College (in 1928). Zev Eleff’s 2011 article on a proposed national Jewish university highlights the possibilities and tensions inherent in the former idea: Proponents, most notably Louis Newman, argued that Jews needed an outstanding institution of higher education that would welcome them, just like their non-Jewish counterparts had. Eleff points out that Newman was inspired by the contemporaneous founding of Hebrew University in Jerusalem. But the idea found many detractors, most of whom argued that Newman’s proposed ‘Menorah University’ would be essentially throwing in the towel on the effort at joining the American mainstream—it was, in their words, un-American. Instead, they encouraged Jews to continue going to state universities. Where Newman’s vision had its roots in the assimilationist narrative of late-19th and early-20th century Reform Judaism, Bernard Revel’s vision of Yeshiva College, which he first outlined in 1923, had its roots in the yeshiva world. Revel himself was an iluy, a child Talmudic prodigy, and upon his arrival in the United States he earned the first doctorate at Dropsie College in Philadelphia, writing about Philo. Revel’s vision received similar critiques to those leveled against Newman’s idea—essentially that it was un-American to develop parochial education; but Revel was also attacked by traditionalists who saw the idea of Yeshiva College as leading on a dangerous path away from tradition. Yet the idea for Yeshiva College was initially a concession to reality: students at the Yeshivat Rabbi Yitzhak Elchanan (RIETS) needed to get college degrees in order to get decent jobs. Their choices were thus to attend night school or drop out of yeshiva. 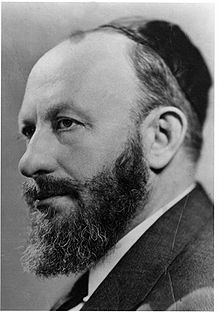 Revel himself had some loftier visions for what the institution could be, and invoked language of integration and synthesis, but largely he was alone in this effort, one of only a handful of men with deep Talmudic backgrounds and PhDs. With the founding of Yeshiva, he began to collect others who shared similar training and commitments, but it would be left to Samuel Belkin and the generation after World War II to make Yeshiva into a University and truly flesh out a vision of synthesis. Randy Pausch delivering the commencement address at Carnegie Mellon University, 2008. I have been looking at commencement speeches over the last few days, for work purposes. (No, I’m not giving a commencement speech anywhere.) Commencement speeches are an interesting genre, and living in the post-modern times we do, many commencement speakers now make reference to that very fact—acknowledging the form of the speech, then trying to make light of it, and ultimately embracing it: Here’s what I’m supposed to tell you; Here’s what you really need to know; Here’s all of that restated in flowery language. Besides this observation about form, what has struck me in reading through a bunch of these speeches is how many of them bring up something related to death. Randy Pausch’s Last Lecture—which he gave many times before he died, and published as a book as well—is now the classic example of the genre, but most commencement speeches tap into a similar sentiment, if not quite as dramatically: remember, the clock is ticking, so think about what really counts. Death awaits us all. Bringing death to the forefront makes whatever we talk about more urgent. It thrusts the conversation into the realm of ultimate concern. In the Torah, as in our own experience, death—the limitation on life—is what makes human life human. “Humans have become like one of Us, knowing good and bad,” God says in the Garden of Eden. “‘And now they might extend their hand and take from the tree of life and eat, and live forever.’ And the Lord God sent them out from Eden to work the land from where they were taken” (Gen. 3:21-22) Human life would not be what it is were it not for death. Parshat Shemini likewise frames experience in terms of death. Partaking of the same dramatic arc as the opening chapters of Genesis, in this parasha we find a moment of union with the divine. Chapter 9 of Leviticus fulfills the story we began in Exodus 25, as the purpose of the Mishkan is fulfilled: “Moses and Aaron then went into the tent of meeting. When they came out, they blessed the people; and the glory of the LORD appeared to all the people. Fire came out from the presence of the LORD and consumed the burnt offering and the fat portions on the altar. And when all the people saw it, they shouted for joy and fell facedown” (Lev. 9:23-24). We would love to stop right here. But then, in the very next verse, Aaron’s sons, Nadav and Avihu, offer esh zara, strange fire, and they die. The perfect moment would not last. Death intrudes. Following a line of midrashic interpretation, it seems that Nadav and Avihu partook of a brash youthfulness not unfamiliar to us today: they failed to show respect for their teachers, they got drunk (and, if the later commandments in the parasha are an indication, perhaps they also grew their hair long). Which is to say that they typified a young adulthood that forgets, or simply isn’t aware of, mortality and all the limitations that stem from it. From this incident springs Yom Kippur, as we will read in two weeks (Lev.16). If the commandment of Pesach is to imagine ourselves as though we left Egypt, the goal of Yom Kippur is to imagine ourselves as though we are about to die. Pesach, a child-centered holiday which takes place in the youthful season of spring, evokes in us a youthful spirit, as the world opens up. Yom Kippur, an adult-oriented holiday that takes place in the older time of autumn, brings out a mature sensibility, as the world prepares for the death of winter. And just as we are to take a part of Pesach with us all year and remember the Exodus every day, likewise we are instructed to carry part of Yom Kippur with us do teshuva every day too. This could all sound like the message of a commencement speech. But I would add one final word to distinguish it. I mentioned earlier that many of the commencement speeches I’ve read take the reality of death and lead to a message of the importance of self-expression, authenticity, being who you want to be. The Torah, and Jewish tradition more broadly, makes a different move. The reality of death demands less that we ask who we want to be, and more For whom and what are we responsible? The language of Torah is not as much about self-expression as about responsibility and commitment. The reality of death, the reality that frames all of our lives, prompts us to ask (Lev. 10:10-11) What is holy? What is good? And What is right?, and to strive for a life answering those questions. As I mentioned in my post the other day, the starting point for many discussions of the modern American university is frequently Laurence Veysey’s The Emergence of the American University, first published in 1965. Purely as a work of intellectual history, Veysey’s volume still stands out. It is clear, comprehensive, interesting, thoroughly-researched, and original. I imagine that after first reading it, most people would have a similar reaction: Thank you for making this make sense, and for such an entertaining journey. Veysey’s main thesis is that the modern American university took shape between the Civil War and World War I, and that the basic arrangements of that period remain with us to this day. While American colleges certainly existed and proliferated before the Civil War (mostly thanks to various Protestant denominations), the scene was transformed in this period through government investment (the Morrill Act, which established land grant universities, was enacted in 1862), the alignment of higher education with industry, and the importation of the German university model by the 10,000 Americans who earned PhDs at the University of Berlin and Germany’s other institutions in the mid-19th century. The increasing industrialization, urbanization, and ethnic and religious diversification of this period also had immense effects on the contours of the American academy. Veysey argues that American universities founded or transformed in this period emerged out of three various understandings about the purpose of the university, which he identifies as: i) Service; ii) Research; and iii) Liberal Culture. The service ideal postulated that the university existed to train citizens who would be of service to society as professionals and political leaders. Andrew D. White, founding president of Cornell University, took this tack, bringing professional schools under the umbrella of the university. The purpose of the university in this understanding is to be responsive to, and at the forefront of, society. The research ideal was modeled on the German university, and prized original scholarly research (wissenschaft, or what Americans came to refer to as Science) above all else. A university was to be at the apex of an educational system, and the faculty were to be its most honored individuals. A university did not exist for the sake of professional education, but rather to create the space in which a professor, surrounded by a small number of highly qualified graduate students who themselves would become professors, could produce new knowledge. Johns Hopkins, which originally did not have an undergraduate program, was modeled on this ideal. Henry Tappan’s vision for the University of Michigan, which led to one of the early developments of a public education system in America, also drew inspiration from Germany. The Liberal Culture ideal, the third in Veysey’s typology, was understood in at least two different ways—which Bruce Kimball is very helpful in understanding. As Kimball observes in his outstanding book Orators and Philosophers, one way in which “the liberal arts” is understood sees reading the classics of civilization as handing down a tradition, forming the young adult mind and body into a person who does what liberal (meaning free—people with leisure) do. Kimball calls this the oratio ideal, in which the liberal arts teach the discipline of public speaking and influence, the work of only free people in the ancient world. The second version of the liberal arts, according to Kimball, follows the ratio ideal, in which studying the classics of Western thought trains one to be a critical, independent thinker (a rational person). According to this understanding, studying ancient Greek philosophy is less about doing what gentlemen do than about becoming truly free-minded. While Yale of the 19th and early 20th centuries might typify the oratio ideal, Robert M. Hutchins’s University of Chicago would exemplify the ratio ideal. Rabbi Bernard Dov Revel, PhD, first president of Yeshiva University. I’m preparing for my last round of qualifying exams for my PhD program. One of the wonderful challenges in this process is preparing a reading list and writing the questions. As a recent column by a graduate student in the Chronicle of Higher Education observed, the point of qualifying exams is to have a collegial conversation with your future colleagues, the faculty. And that means doing original thinking, bringing together previous knowledge and ideas into new formulations and new theories. That’s both thrilling and daunting. My general area of interest is the intersection of American Jewish life and American higher education, and particularly in the story of Modern Orthodoxy. My academic work has taken me well into the literatures of both these areas, and there aren’t too many other folks who have done the same thing. A number of Jewish historians have done work that touches on the academy, but few seem to have done so from the perspective of the literature on the history and philosophy of American colleges and universities. And some of those who work in the latter area have touched on Jewish life, but generally their treatments focus on the exclusion of Jews from elite academic life and their eventual inclusion as part of the expansion of American higher education after the Second World War. And virtually no one I’ve come across, with the exception of Zev Eleff, has taken up these two areas with an additional eye on Modern Orthodoxy (if you’re out there, we want to know!). In the department of the general relationship between American Jews and American higher ed, Harold Wechsler and David Ritterband’s book on Jews in the Academy is the place to start. David Hollinger’s intellectual biography of Morris Raphael Cohen remains a formidable piece of scholarship, and his book Jews, Science, and Secular Culture is also a wonderful collection of thoughtful essays on the ways in which Jews and academe have worked together in mutually reinforcing ways. Lila Corwin Berman’s book Speaking of Jews is also very helpful, though its focus is not on universities per se. But trying to find folks who are as conversant in Lawrence Veysey’s The Emergence of the American University (the classic starting point for most scholars of modern American higher education) and Julie Reuben’s The Making of the Modern University (a more recent classic), on the one hand, and Jeffrey Gurock’s The Men and Women of Yeshiva or Samuel Belkin’s In His Image on the other, is a real challenge. Alan Brill, whose contributions to understanding Modern Orthodoxy in the context of wider trends in thought and intellectual history are enormous (and whose expertise and intellectual generosity have greatly assisted me), is essential. Among the handful of people who think about Jewish life from the standpoint of historical scholarship on higher education, most have focused on non-Orthodox figures like Cohen, Jewish social scientists (Horace Kallen, Oscar Handlin, Nathan Glazer, Marshall Sklare, etc. ), Jewish historians or Semiticists (Salo Baron, Harry Wolfson, Felix Adler, Morris Jastrow), or Jewish literary figures (e.g. Lionel Trilling). While many of these men grew up in Orthodox families, none remained so. Thus virtually all of the studies I have read that have a foot in the world of scholarship on American higher education don’t deal with the Orthodox world, at least not as anything more than the background to a nostalgic or hated childhood in the lives of formerly Orthodox academics. So this is where I am aiming to come in. There are a few histories of Yeshiva University (Klaperman’s hagiographic piece from the 60s, Gurock’s work, Rakeffet’s biography of Revel), but none of them deal with Yeshiva from the broader perspective of American higher education. There are some sociological notes about the fact that higher education is a sine qua non of Modern Orthodoxy in comparison to Haredi Orthodoxy. But there isn’t a full-fledged examination of how the idea of the university influenced he development of Modern Orthodoxy, much less how that same idea functioned for the larger American Jewish community. How was one to adjust the competing claims of quantity and quality, of democracy and excellence, of the professional or vocational and the liberal? How would one reconcile the practical and the theoretical, the development of means and the formulation of ends, the criteria of the graduate school and the ideals of the liberal arts college? How many subjects can be effectively taught in an age of specialized knowledge? Is there any longer a common body of knowledge to which it is desirable to expose all college men and women? What kind of a liberal arts curriculum is meaningful in an age of specialization? How much common organization and how much individual choice should such a curriculum provide? These questions have as much to do with American Jewish life and Modern Orthodoxy as they do with colleges and universities. What is it to be a good, educated human being, and a good and educated Jew? What should an educational institution look like based on that vision? How are Torah and ‘secular’ studies to be defined, learned, and understood? How does an institution’s approach shape the values of both the individuals under its roof and the larger communities of which they are a part? Those are the questions I aim to explore.